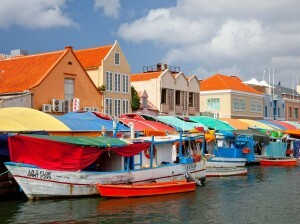 WILLEMSTAD - The Venezuelan fruit boats must return to Sha Caprilleskade. This is according to the opinion of a majority of the 80 people that attended last week’s discussion evening organized by the Minister of Economic Development. There was also a call from the group for more nightlife on the island. This will be able to give the area more life during the evening hours. Earlier the government indicated that it will not allow the fruit boats from Venezuela to return to the same location, but it seems now that things will be as it was before the Venezuelan embargo. The Sha Kaprileskade in downtown Punda has been the station of the well-known, and tourist attraction, floating market for a little over 100 years now. It has become part of Punda and the majority of the people would like to see this area return to its familiar activities.